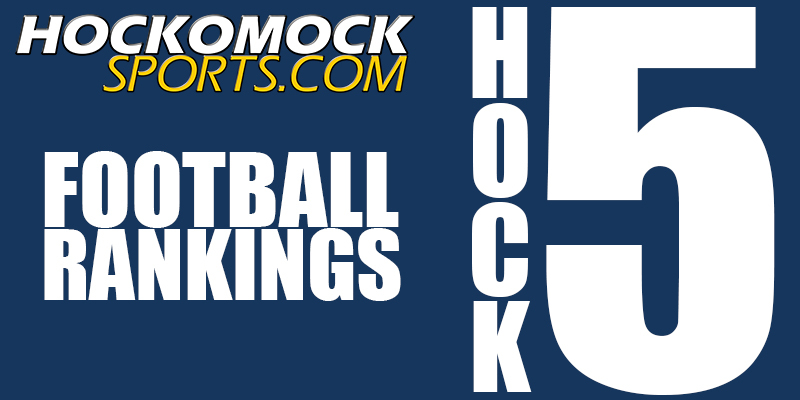 Football Hock 5 Football Hock 5 Football Hock 5 Football Hock 5 Football Hock 5 HockomockSports.com HockomockSports Stoughton Stoughton Stoughton Franklin King Philip Mansfield Stoughton North Stoughton Oliver Ames Stoughton Stoughton Taunton HockomockSports HockomockSports HockomockSports HockomockSports HockomockSports HockomockSports Your source for comprehensive coverage of the Hockomock League. We provide recaps, features, standings, schedules and much more. 1. King Philip 9-3 The Warriors held one of the state's best offenses to just six points but saw their bid for a three-peat of state titles fall just short at Gillette. The loss takes nothing away from the achievement of getting to three straight Super Bowls and with Ryan Halliday back don't count out the Warriors for making another run next year. 2. Mansfield 8-3 The Hornets won the Kelley-Rex division title and reached the D2 South final despite battling injuries throughout the season. Mansfield will have a ton of talent coming back next year, including running backs like Vinnie Holmes, Michael DeBolt, Nick Marciano, and Cincere Gill, to make a run at a Super Bowl appearance. 3. Canton 8-3 It was a season to remember for the Bulldogs, winning their first Hock title since 1990. While the future looks bright with the the likes of Johnny Hagan, Kyle Fitzgerald, and Gersom Rivera coming back, it's tough to overlook to contributions Canton received from the Class of 2019. 4. North Attleboro 8-3 Another year, another league title for the Rocketeers. It marks the fourth straight year North has earned a division crown, which is the first time the program has won that many league titles in a row. Highlighted by Ryan Clemente, Nick Raneri, and Brendan McHugh, this year class has a long list of achievements from the past four years. 5. Franklin 7-4 Nick Gordon broke the Panthers' single season record for passing (24) and total (32) touchdowns this season and Franklin established themselves as a true contender. Now it's up to the returners to try and continue the success established by Ryan Driscoll and the Class of 2019.